I am a beginner making a baby blanket. I am doing something wrong because the blanket is becoming Christmas tree-shaped. Each row is shorter than the last. What should I do when my crocheted blanket gets narrow at the top? Can anyone help me figure out what I am doing wrong? Thanks very much. This is a really common problem for beginners, and even experienced crocheters, to have. In most cases, the solution is really simple (in theory, anyway.) Count your stitches, either as you work, or after you've completed each row. Make sure you have exactly the number of stitches you are supposed to have. 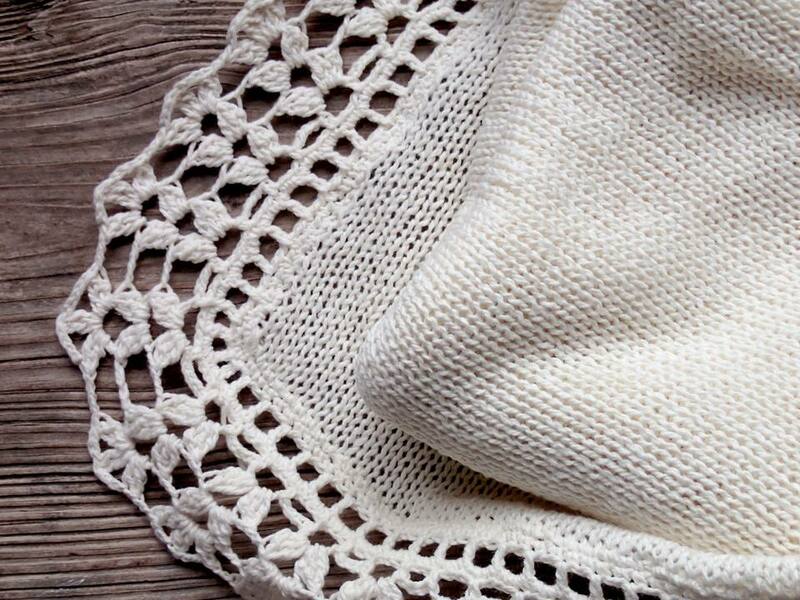 It sounds to me like you are crocheting fewer stitches per row as you work up. Even if you lose only one stitch in each row, as you build more and more rows on top of each other, the afghan will get narrower. It's really easy to miss stitches at the beginnings and ends of rows. This sometimes happens to everyone, even crocheters who've been at it for years. That's why counting is recommended; when you know how many stitches you're supposed to have, you can figure out if you're missing any, and add the stitches if necessary before you move on. If you don't discover you're having this problem until you're really far into your piece, fixing it can be aggravating, because there's no easy way to add the stitches now that you've worked past the rows where they should have been. Sorry to be the bearer of bad news. The cleanest solution is to find the last row where you worked the correct number of stitches, and rip out all the work you've done past that point. But, there are other solutions, if ripping all that work out would break your heart. If you haven't already learned about freeform crochet, now is a great time for an introductory freeform crochet lesson. Freeform crochet is another fantastic solution at times like this. We posted a photo on this page showing the edging around the outside of a freeform crochet blanket. The edging is totally freeform too. The blanket is totally irregular, with odd-sized, oddly-shaped patches throughout. We crocheted around the outside of this oddball shape in such a way that it made the blanket almost (but not quite) square. This probably started out with an odder shaped piece than the one you have, and if you could arrive at an almost-square just by working an edging around the outside, I bet you would! If there's one thing learned over the years, it's that edgings can hide a multitude of oddities. You can try putting that knowledge to the test if you are so inclined. We hope this enjoyable art form will bring you much enjoyment.